Idealization is a fundamental feature of human thought. We build simplified models to make sense of the world, and life is a constant adjustment between the models we make and the realities we encounter. Our beliefs, desires, and sense of justice are bound up with these ideals, and we proceed "as if" our representations were true, while knowing they are not. In this elegant and original meditation, Kwame Anthony Appiah suggests that this instinct to idealize is not dangerous or distracting so much as it is necessary. As If explores how strategic untruth plays a critical role in far-flung areas of inquiry: decision theory, psychology, natural science, and political philosophy. A polymath who writes with mainstream clarity, Appiah defends the centrality of the imagination not just in the arts but in science, morality, and everyday life. "Appiah is a writer and thinker of remarkable range...[He] has packed into this short book an impressive amount of original reflection...A rich and illuminating book." 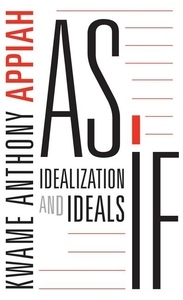 "Appiah is the rare public intellectual who is also a first-rate analytic philosopher, and the characteristic virtues associated with each of these identities are very much in evidence throughout the book."